Later Suzie admits she’s struggled with believing she’s not good enough. And we are again shocked because she’s a woman of faithfulness and excellence in our eyes. I add my own lie, that I have strived to earn my worth because I sometimes don’t believe who I am is adequate. Yet I’m the girl God has used to write books about embracing who we are and becoming all God created us to be. A lightbulb comes on as I realize suddenly that the enemy is lying to us in the area of our giftings. There are going to be times when we need our sisters to lock shields with us too and say, “I’m going to take those arrows for awhile. I’m going to stand in the gap for you.” There is no shame in that either. 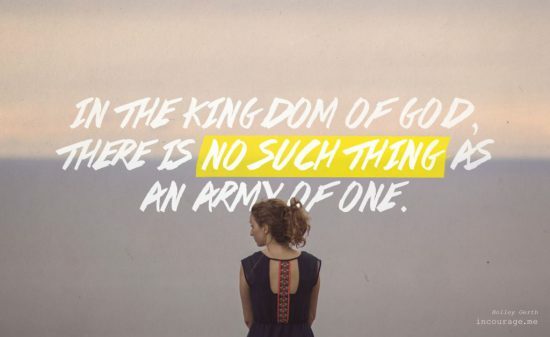 In the Kingdom of God, there is no such thing as an army of one. We are always strong, better and braver together. If you’d like to listen to the entire conversation between Jennifer, Suzie and I you can find it on this #morethansmalltalk video. And if you want more encouragement for overcoming the lies in your life, you’ll find it in my new devotional Do You Know You’re Already Amazing? 30 Truths to Set Your Heart Free. My church used You’re Already Amazing for our women’s retreat. We wanted more, so our small group went back through it chapter by chapter. Personally, I feel that God spoke to me through this study & through Holley’s loving personality. We shared together our feelings of not being enough, not doing enough…as women often feel. We came away feeling God’s fullness in our hearts; knowing that God loves us right where we are. We are grateful to have found this study. I recommend your book in my Recommended Resources list of 7 Days of Soul Care.